“He is so stupid.” In an otherwise quiet theater, one woman spoke for all of us as Emraan Hashmi’s character in Hamari Adhuri Kahani set out to do something moronic. This is not a good movie. Hamari Adhuri Kahani is among the most earnest, corniest movies ever. It feels like it was written by a clever 15-year-old girl who isn’t as worldly-wise as she thinks she is. That it is actually written by a man in his mid-60s — Mahesh Bhatt — is a problem. Vidya Balan plays Vasudha, a hotel florist and single mother of a 5-year-old son, Saanj. Her husband, Hari (Rajkummar Rao), ran off just after Saanj was born, yet Vasudha is regularly caught off guard by questions about her husband’s whereabouts. After five years, she doesn’t have a pat answer? Her world is turned upside down when her exemplary customer service impresses hotelier Aarav (Hashmi). Aarav is a teen-girl-fantasy: a lonely rich guy who wants nothing more than to make all of Vasudha’s dreams come true. That he wants to do so primarily to make up for his own childhood as the impoverished son of a single mother who worked in a hotel just makes things weird. Vasudha and Aarav are overly melodramatic about everything. He makes an entire plane full of passengers wait so that he can smell some flowers that remind him of her. She’s torn by the fact that she’s married, even though Hari is a cartoonish jerk who may be a terrorist. As if emotional fireworks aren’t enough, there are actual fireworks. Also a hotel fire, bullets, and landmines. 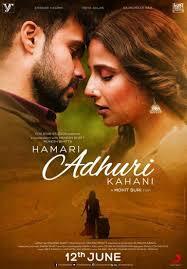 Essentially, Hamari Adhuri Kahani is a series of wordy, teary-eyed scenes with cheesy dialogue followed by explosions. Vasudha’s future plans are also questioned in cultural context: is she going to be like Sita in her marriage to Ram or like Radha in her relationship with Krishna? Again, I’m not overly familiar with either parable, but the meaning is apparent: does Vasudha want to be a devoted wife even at the expense of her own life (Sita-Ram), or does she want a more egalitarian kind of love (Radha-Krishna)? The cultural and religious references are used to criticize the historically unequal treatment of women in India. One older woman says ruefully, “Even after they are dead, men still control a woman’s body.” The movie’s feminist sentiment feels hollow for a couple of reasons. First, Vasudha is a dud. It’s hard to care about such a passive heroine. When she finally decides to take action, the action is to beg Hari to stop being such a jerk. Second, Vasudha’s romance with Aarav is a relic of Bollywood stalker love stories. In a dramatic conversation in the middle of desert in front of an approaching sandstorm, Aarav uses as proof of Vasudha’s love for him…a piece of paper upon which he has written her name multiple times. Wait, what? How exactly do his schoolboy doodles prove that she loves him? It doesn’t ultimately matter, since Vasudha eventually begs Aarav to teach her how to love again (more begging!). There’s not much Balan and Hashmi can do with such one-dimensional characters. Same for Rao, who just shows up periodically to be mean in different wigs. The resolution to Aarav’s arc is telegraphed, yet it’s so cornball that it’s hard to believe that Suri will go through with it until it actually happens. When it does, it is sublimely ridiculous. Hamari Adhuri Kahani is stupid, yet I left the theater with a smile on my face. This entry was posted in Reviews and tagged 1 Star, 2015, Bollywood, Emraan Hashmi, Hamari Adhuri Kahani, Hindi, Indian, Mahesh Bhatt, Mohit Suri, Movie Review, Our Incomplete Story, Rajkummar Rao, Vidya Balan on June 12, 2015 by Kathy. I think this movie falls into the “so bad, it’s good” category. I hated the characterizations and the predictability of the screenplay but I did have a very good time in the theater. Wow. Luckily no one pelted out like that where I watched. But people were pretty much laughing all throughout. Haha. Absolutely hilarious. Your review just made my day Kathy. The film somehow managed to hit every cliche imaginable in a love story. Also the film has a gigantic plot hole. The film is narrated by the husband, a person who was not supposed to have any information about those events as he was being held captive at the time. OMG, I forgot about that, Vivek! How the heck does Hari the husband know the details of Vasudha’s romance with Aarav?! That’s so funny! Yep. Can’t say I’m surprised. I would be is a Vishesh Films production was actually even remotely decent. Balan’s losing her touch. Feel like Hashmi talked her into this. I blame him for everything. To be given a miss, surely!